I should begin this review by noting that I am a great fan of Alan Moore. His Watchmen goes beyond being one of the great graphic novels of our time - it's actually one of the finest works of modern literature. Famously, Moore has been thoroughly displeased with every single film adaptation of his work - and generally, he's right to be unhappy. From Hell is disappointing despite the presence of Johnny Depp; The League of Extraordinary Gentlemen is easily one of the worst films of the decade; and Constantine is simply blah. When I began reading that Moore had expressed misgivings about the theatrical imagining of his V for Vendetta, I became alarmed, and my concerns were made more significant when it was delayed for several months. Upon its release, though, I found V for Vendetta to be smart, entertaining, and appropriately dark and dreary. Having read the graphic novel, I can understand Moore's vitriol - much is changed from his vision of a dystopic future, and it is dilluted to some degree. The film still succeeds in its own right as an engaging, thought-provoking project. In movie form, V for Vendetta evokes memories of 1984, and not simply because John Hurt has a key role. In Vendetta's England, everything good is bad for you, and the government monitors many aspects of daily life. Music piped over public loudspeakers and shows aired on television further the Chancellor's cause. In the midst of all this order, though, one man hopes to enforcce change. His belief is that the only way to draw attention is through terror, which is a problematic message in this day and age (the graphic novel was written long before 9/11 and the bombings of the London Underground). It's understandable why the film provoked some strong reactions and occasional negative reviews as the subject matter is difficult and there is certainly a political ideology underlying the action. 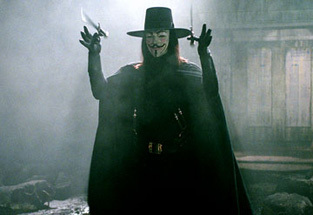 Although Natalie Portman gets most of the attention as the film's primary star (she does allow her head to be shaved for the role, after all), it is performances from Hugo Weaving - always beneath the Guy Fawkes mask - and Stephen Rea that allow V for Vendetta to be so impacting. Weaving's crisp accent suits the masked "V" quite well, and that is vital since the voice is what makes the character development work. Stephen Rea, however, is the key figure. He is a cop who is world-weary and sad at what his society has become, yet he must solve the mystery of V and his female companion. Also to director James McTeigue's credit is the fact that the production values and special effects are outstanding given the generally low budget V for Vendetta was given. It's very apparent that he has learned well from his mentors, the Wachowski Brothers, using pyrotechnics and unique battle scenes to add heightened tension. Although I am mostly thrilled with the way V for Vendetta turned out, I was slightly disappointed in the ending. It was wildly divergent from the book and its intent, and felt a bit overbearing and up with people for me. Even with that small complaint, however, I find V for Vendetta to be a thrilling entry into the political action genre. There are several different editions of the DVD available on its first day of release. One is a bare-bones edition, one a two-disc Special Edition, and finally, some stores are offering a set that includes a "V" head in its Guy Fawkes mask. I'm a little down about the lack of commentary on the Special Edition, but some of the features are terrific. There's a "Making Of" featurette, a detailed history of the real Guy Fawkes gunpowder plot, a short about the comic book itself, and a documentary on the design of the not-so-distant future. It's a solid package even if it seems highly likely that a better, even more super edition will hit shelves at some point down the line.